The purpose of this post is to say thank you to our family who did so much for us this holiday season! We were able to escape to winter bliss for nearly four weeks because of your generosity, flexibility, kindness, hospitality, patience and love. 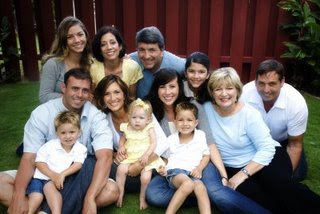 The GibsonFetzerMaero clan (left to right, back to front): Jacqueline, Jodi, Steven, Keli'i, Linds, Amanda, Lilli, Noa, Malia, Maika, Carol and Dan.